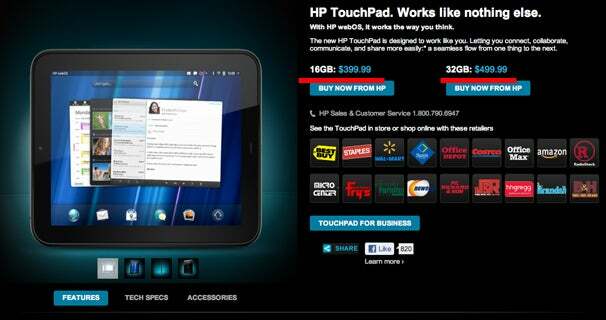 HP permanently slashed the price of its TouchPad tablet to $399, in a desperate move to rival the Apple iPad. HP’s website now lists the TouchPad for $100 less than at launch, in what could signal a price war with other tablet manufacturers, who are struggling to at least match the price of the iPad, the tablet market leader by a high margin. HP has tried very hard to entice customers to choose its tablet over the iPad, or at least over other Android-based iPad competitors. First, HP offered a $50 rebate, then a weekend-only $100 discount, and finally a Woot offer--a total of three price cuts in one week. But the temporary offers probably did not help sales enough, and now HP has indefinitely cut the price of the 16GB TouchPad to $399, and to $499 for the 32GB model. The price change is not reflected on the HP Palm site at the time of writing. “Despite the very short runway, we were pleased with customer response and, as a result, have made the decision to implement a $100 price drop on the U.S. list price of the HP TouchPad, enabling both HP and our channel partners to be even more price competitive in the marketplace,” said Stephen DiFranco, HP's senior vice president of personal systems, in a note to some retailers. The new lower pricing of the TouchPad now brings the HP tablet down to the same price range as the Android-powered Iconia Tab from Acer ($395) and with the Eee Pad Transformer from Asus ($399). Acer previously slashed the price of the Iconia Tab from $450.